Invitations said it all—“We did it!” Here, then, is the state of Clear: its dimensions, freedoms and characteristics. Nowhere is it so thoroughly laid out. 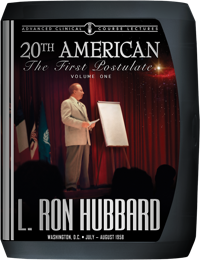 Defining a Clear in terms of “freedoms from, ” L. Ron Hubbard shows the progressive steps to move anyone toward this state, including the handling of present time problems and ARC breaks. It all culminates in a “magic button” with the power to open up any case, and summed up in one word: Help. As he describes, it handles “something like TNT”—that splits valences, exteriorizes preclears and puts people into session who were formerly not even vaguely auditable. Directly on the heels of Help as the “heart and soul of the upper dynamics,” comes the yardstick of judgment: how many dynamics does a person compute on instantly? While on the other side of the coin are the negative dynamics —the realm of psychiatrists and makers of the A-bomb. At which point Mr. Hubbard reveals how to bring a being to a state where he can remain at cause, no matter the level of violence in a world gone mad. Today, Clears exist by the tens of thousands in virtually every country of Earth. Here is the moment, immortalized forever, when the first was announced. 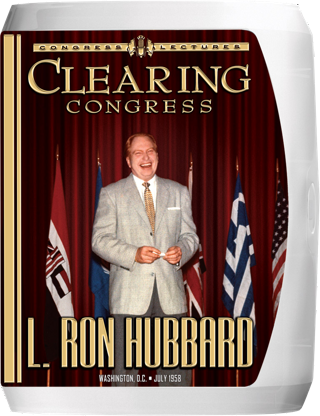 And so it was, in July of 1958—lights flooding the room, cameras rolling with color—that L. Ron Hubbard stepped to the stage with The Fact of Clearing. 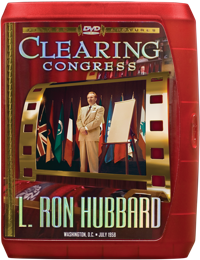 For while Mr. Hubbard would continue to work for more than a quarter century to make it easier and faster for every being to reach that long-sought goal, here is the legendary Congress where Clear became a first reality, the moment of achievement immortalized.